Not Only Does He Ride a Motorcycle, He's Famous! 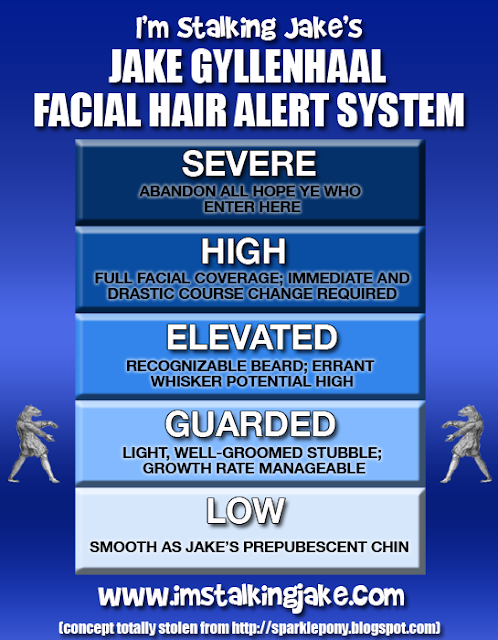 The things we're learning about Jake this week! Today, via The Twitter, I ran across a very interesting article (which was published yesterday so most of you are probably over it already) from the Miami Herald, which you can read HERE...interesting because not only does it exhibit a new and progressive take on punctuation, but interesting because the person who wrote it appears to have fallen unconditionally and irrevocably in love with Jake during the writing process. And can we blame him? Charles Cotayo, reporter extraordinaire, tells us (after several paragraphs filled with words like "charisma," "superstar," and "versatility") that last weekend, "...Gyllenhaal, with the physique of an Olympian, drew the public like a magnet to the their local cineplexes." Except...Jake sort of didn't do that so much...but I truly appreciate Charles stretching the truth for the people of Miami! My only quibble with the article is that Charles calls our Gylls an "A-Lister." 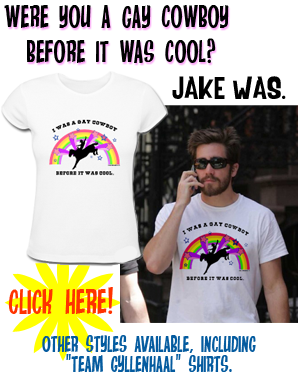 ACTUALLY, according to a highly scientific calculation which I am by law required to keep secret, Jake Gyllenhaal clocks in at 7.4 on the I'm Stalking Jake! Fame Scale (ISJFS), which extends from Your High School English Teacher (1) to Susan Boyle (10). This puts him just above Justin Bieber and slightly below Megan Fox. Upside of this Fame Level - Available in plastic form at most regional Wal-Marts. Downside of this Fame Level - Still less famous than Orlando Bloom. Aside from this minor slip-up, though, the article Charles has written just might be the most pro-Jake piece I have ever read. (Just wait till you get to the part about Jake being a scholar of classical literature. Who knew?!) He even manages to soften the critical responses to Prince of Persia by poetically calling them "mixed reviews that leaned toward the darker side of the star-rating system." Charles Cotayo, your check's in the mail. Justin Bieber from HERE, Megan Fox HERE. I'm getting ready to write off an angry letter!! Not once was he referred to as Gylls, which is obviously ESSENTIAL to being an A-Lister. You need a catchy little nickname. Besides, it will take the attention away from the gil-en-hall, yillenhooolahay, jibberdeedoo, etc. question. That being said, I love any mention of Jake in any media piece. I was searching for info but got extremely distracted watching THIS VIDEO, which is, like, amazing. And it's so true that having one, clearly defined nickname is basically the only thing he lacks at this point to move into the A game. God, he's so damned close...we're working on it, Jake! 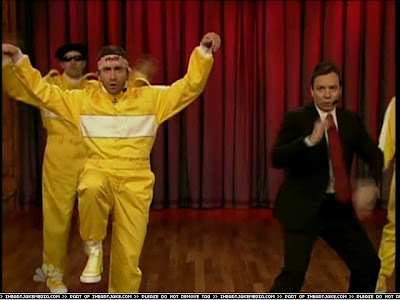 My, oh, my...that hedgehog dance brings back memories...of one of Dastan's poses...and that white bird guy he played on SNL! What a good sport Jake is! One more reason why he is so blasted adorable...! no parkour-ing into the car! oh, that gylls! Are there stars to go under the merit badges like in cub scouts? 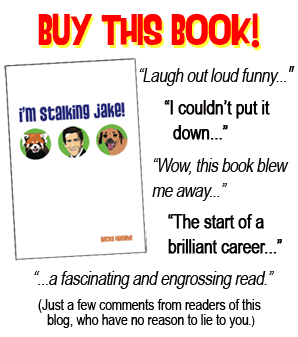 I just made Jake singing "The Fox" my outgoing message on my answering machine. Somebody stop me! Jake looks gorgeous as always! Linda, yay!! Thank you so much and welcome to the fold! And can I just say that Jake ALWAYS shows up in paparazzi pictures immediately after I put up a post. He does this on purpose, because he knows it drives me nuts. AWESOME. We only accept obsessed fans around here!! ;D In fact, as I write this, I'm trying to decide whether or not I should post the car post now or wait until tomorrow. What if there's nothing to post about tomorrow? Or what if there's lots to post about tomorrow and I miss my opportunity by waiting?! These are the things that keep me up at night!! I think I've decided I'll post right before I go to bed. And if this means it's a slow day for tomorrow, we're all just going to have to deal with that. I can only do so much! Perfect! I'll be sitting here waiting for that post. This site is how I end my nights. Absolutely love your posts. Please don't stop being fantastically obsessed. It's far too amusing and NECESSARY. See PG, you wont regret this... KD put it perfectly, thats why you do this!